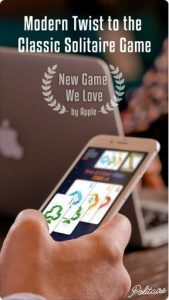 A handcrafted Solitaire game with Poker blended, interesting game mechanics, charming clean visual & a native feel one handed portrait play! Politaire is a minimalistic, a new modern Solitaire experience prepared just for you. Politaire is a Solitaire mixed with Poker. Your aim is to make winning hands with 5 active cards in your hand. Choose cards that you want to discard and swipe it away. Upcoming cards will fill up your active hand and score if you make a winning hand. Discarded cards will go back to the pile, waiting to come up again. The minimalist visuals hide an interesting depth that will keep challenging and surprising as you master it. 2 game modes (Single Deck & Double Deck). Game Center Leaderboards & Achievements & Cloud saves. Night Mode (For night play). Thank you for trying Politaire!